COLMER, William Meyers, a Representative from Mississippi; born in Moss Point, Jackson County, Miss., February 11, 1890; attended the public schools and Millsaps College at Jackson, Miss. ; taught school at Lumberton, Miss., 1914-1917; studied law; was admitted to the bar in 1917; during the First World War served as a private in the Quartermaster Corps, advancing through the ranks to regimental sergeant major, and served from July 24, 1918, to March 17, 1919; commenced the practice of law in Pascagoula, Miss., in 1919; county attorney of Jackson County, Miss., 1921-1927; district attorney of the second district of Mississippi from 1928 until his resignation in 1933, having been elected to Congress; elected as a Democrat to the Seventy-third and to the nineteen succeeding Congresses (March 4, 1933-January 3, 1973); chairman, Committee on Rules (Ninetieth through Ninety-second Congresses); unsuccessful candidate for the Democratic nomination for the United States Senate in 1947; was not a candidate for reelection in 1972 to the Ninety-third Congress; was a resident of Pascagoula, Miss., where he died September 9, 1980; interment in Machpelah Cemetery, Pascagoula, Miss. Papers: 1933-1973, 365 cubic feet. 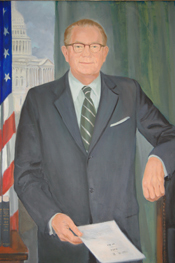 The papers of William Meyers Colmer contain correspondence, legislative files, speeches, newsletters, photographs, motion picture film, clippings, scrapbooks, and artifacts. A finding aid is available in the repository and online. Oral History: 1973, 129 pages. An interview with William Meyers Colmer conducted by Kenneth G. McCarty, Jr. on May 1, 1973. Oral History: 1974, 29 pages. Interview with William Colmer conducted on May 5, 1974. Oral History: 1974, 29 pages. Furnished by agreement with Lyndon B. Johnson Library. Restricted. Papers: In the Carl Bert Albert Papers, ca. 1910-1976, 1000 cubic feet. Other authors include William Meyers Colmer. An inventory is available in the repository. Gray, Victoria Jackson, contestant. Contested-election case of Victoria Jackson Gray v. William Meyers Colmer, from the Fifth Congressional District of Mississippi, Eighty-ninth Congress. Washington: Government Printing Office, 1965. Schlauch, Wolfgang. "Representative William M. Colmer and Senator James O. Eastland and the Reconstruction of Germany, 1945." Journal of Mississippi History 34 (August 1972): 193-214.